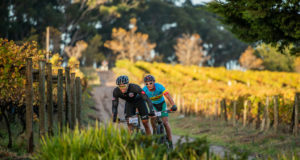 Reigning Mountain Bike Marathon World Champion Henrique Avancini and his German partner Manuel Fumic have been crowned 2019 Momentum Health Tankwa Trek presented by Biogen champions. The Cannondale Factory Racing team won three out of four stages to finish with a hard-earned three minute gap on their competitors. The victory comes especially sweet after the 2018 event, where Fumic was forced to abandon the race due to injury. “Racing comes with a lot of life lessons. We were devastated last year, and I made a promise that I’d keep coming back to this event with Manuel until we eventually won it. Proud to overcome that setback today and get some solid preparation for the season ahead,” said Avancini. It was Urs Huber and Simon Stiebjahn that crossed the finish line first on the final stage. The Team Bulls riders were the main protagonists for the Tankwa Trek throne, but after an unfortunate wrong turn in the final kilometres of stage three were ultimately forced to settle for fourth overall. The 2019 overall podium was then rounded out by the ‘backup’ Cannondale Factory Racing team of Maxime Merotte and Cameron Orr, and Denmark’s Simon Andreasson and Jonas Lindberg in third. After an exciting turn of events in the women’s field, local fans were elated to see a set of South African hands on the Tankwa Trek trophy. Sweden’s Jennie Stenerhag and South Africa’s own Mariske Strauss stormed to their second consecutive stage victory and the overall title. It was a slow start to the event for the Silverback Fairtree pair, who had to play catch up after a testing first half of the event. “If there was a section of the race that we knew we were going to shine, it was on the Merino Monster. We narrowed the gap on the rest of the field on that climb, and then just kept it together to hold onto that lead on today’s stage,” explained Stenerhag. 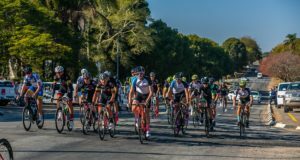 The cycling god’s were cruel to Team Summit’s Annie Last and Candice Lill, who were plagued by mechanical issues in the opening stages of the race. The pair fought hard for their second spot overall, however, and their form bodes well for the remainder of the season. Ghost Factory Racing’s Barbara Benko and Anne Terpstra finished in third. Tankwa Trek victory initially looked promising for the pair of National Champions who raced the first two stages donning the pink jerseys. Adding a cherry to the top of an already highly successful event, Momentum and Biogen announced the extension of their contract for another three years. Tankwa Trek riders will head home with elation as they look forward to the 2020 installment.